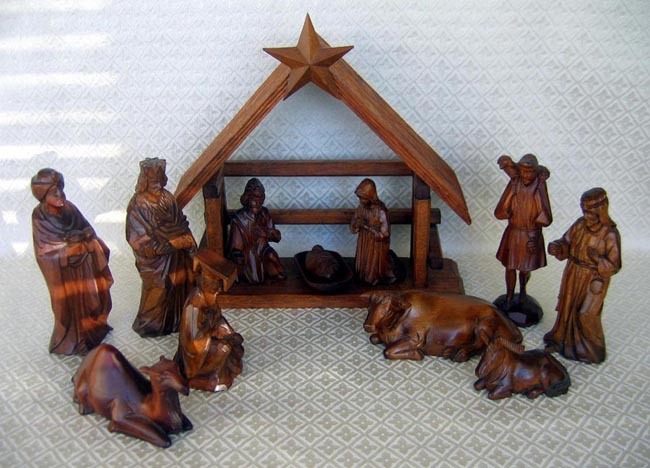 This Nativity is handcrafted wood with twelve pieces: the Holy Family, two shepherds, a cow, a donkey, three wise men, a camel, and the stable with large star. The stable is 10 by 12 by 3 and the tallest figures are 8 inches tall. Joseph and one shepherd have holes for staffs, but did not come with any. It was made by Kim Boo Ho Wood Carving in Seoul, Korea. The three wise men represent the three known continents in ancient times: Africa (Arabia), Asia, and Europe. The Asian wise man’s costume includes a wonderfully unique flat-topped hat.